This healthy Banana Protein Shake recipe is the perfect morning smoothie or post-workout shake. It is refined sugar free and super easy to make. Made with clean, nutritious ingredients like banana, natural protein powder, milk, and honey! This recipe could not be easier: Simply add all of the ingredients – milk, banana, ice, honey, and protein powder – to a blender and blend until smooth and creamy. Tip: When adding your ingredients to your blender, always add the liquid (in this case, the milk) first near the blades. Doing this will help your blender to run a bit more smoothly whenever you are making a shake. If having a protein shake is a part of your regular breakfast routine, I highly recommend checking out SmoothieBox. SmoothieBox is a smoothie kit delivery service that is organic, nutrient-dense and free of added sugars. Each box comes with 20 smoothie packs that are filled with frozen fruits and vegetables, nuts and grass-fed collagen protein. Each shake is ready in less than 3 minutes and tastes fantastic! The cost is just $5.95 per smoothie and delivery is FREE. To make your morning routine super quick and easy while enjoying a healthy, nourishing breakfast at the same time, give SmoothieBox a shot. Click here to try out SmoothieBox for yourself! Using a Vitamix Blender, because it is THE blender for making smoothies! A Vitamix is a high-powered blender that breaks up frozen fruit, vegetables, ice and any other dense ingredients into oblivion – with no chunks and easy clean-up. Best of all, the Vitamix blender is super versatile, so you can also use it to make soups, sauces and homemade nut butters. You can check one out on Amazon here. 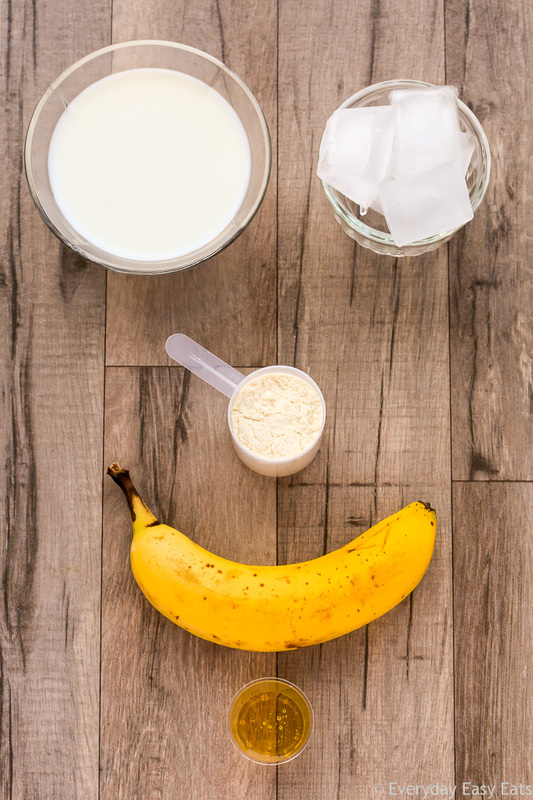 This nourishing Banana Protein Shake recipe is the perfect way to start your day or help your body recover after a workout. Add all ingredients to a blender in the order listed. Blend until smooth. For easy blending, add the milk first near the blades when adding the ingredients to your blender. Just whipped this up, since I had all of the ingredients at home already and it is SO GOOD! I’ve found my new favorite breakfast smoothie! Thanks!! Hi Jessica, that’s great! I’m so glad you liked the protein shake. You’re very welcome! Wow, This sounds yummy also healthy recipe. And looking, easy to make. I will try it for sure. Thank you so much for sharing this yummy recipe with all of us.